Three big days of business action and huge crowds underscored the success of this national earthmoving equipment expo. If anyone thought the success of last year’s inaugural Diesel Dirt & Turf Expo was a one- off, this year’s event convincingly proved the show has a winning formula that attracts industry buyers and sellers. Diesel Dirt & Turf CEO Steve Zivkovich said, “Feedback and experience gained from our first expo last year has helped us improve the flow, layout and functionality of the site. Despite the huge increase in the number of exhibitors from last year, we were able to configure the site to ensure all exhibitors received value for money and maximum exposure. “We recognise the need for ongoing improvement and refinement of many aspects of running a major expo and have taken on board the constructive comments from this year’s exhibitors and visitors. “Panthers Penrith has been extremely supportive. We now have a long-term agreement in place that will ensure this fantastic industry expo site is equipped with the facilities needed to run the National Diesel Dirt & Turf Expo for many years to come. “While business was being done, families enjoyed the spectacular motocross stunt bike entertainment from the ‘Freestyle Kings’, the vintage truck display, rides, music and the expansive and appealing food court and meeting areas”, Steve said. 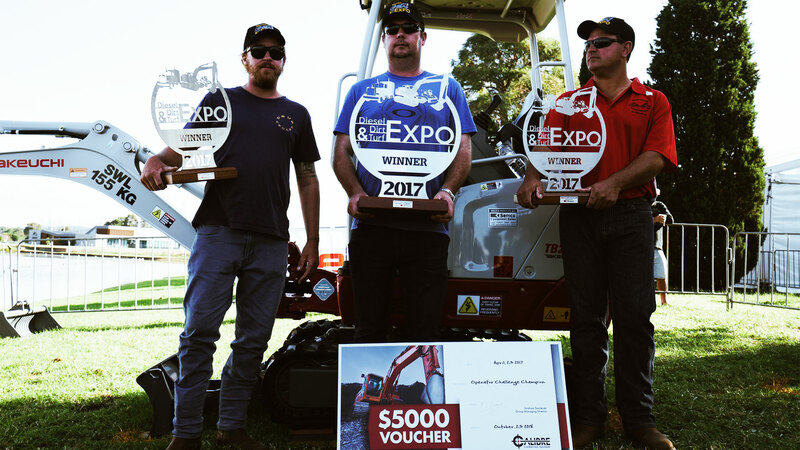 Some of the country’s top machine operators also battled it out in the “Operator’s Challenge” to take away trophies and $21,000 in cash prizes. 0 Comments on "RECORD CROWDS AT SECOND DIESEL DIRT & TURF"